Pretty much all my Prime Ark Freedom laterals are breaking at the base, I have them on a 2 wire trellis so I didn't expect this even though they are 6' tall and hugh. I think its the squirrels and birds but could it be that they are not getting enough water, I'm in Atlanta Ga and been watering them about a gallon every other day in the mid 80's. I just set up some 1 GPH dip emitters and plan on using them maybe 2 gallons a day? The PAF berries when I pick them look black but the next morning there purple and not so good tasting? anyone else have this problem or do I have something else going on? Below is a picture of my Apache and Natchez blackberries I'll be using the emitters on. Typical of most berries, the ripe ones will fall off easily into your hand - if you have to tug at all, they are not ready. I'm not sure what you mean about black ones turning purple -- When the berries are in the shade they could look darker. 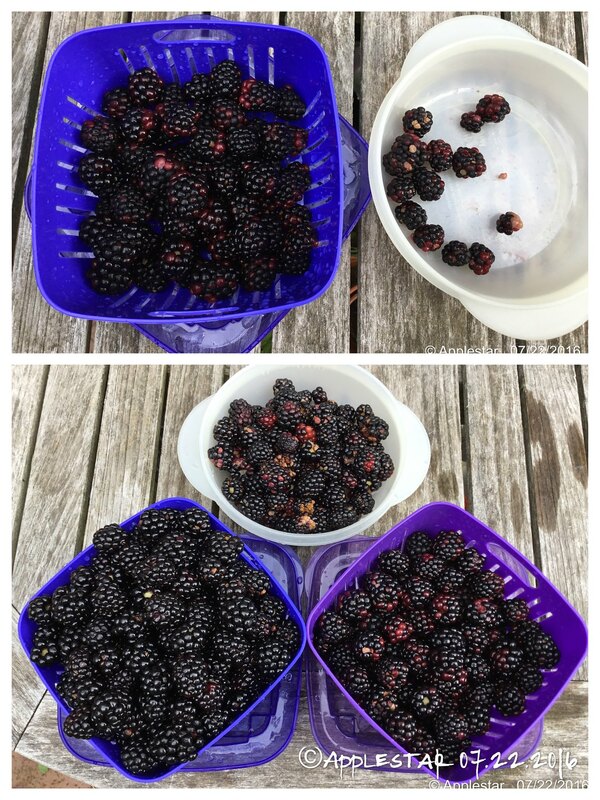 Also there is the classic "berry picker vision distortion" -- The first time you go through picking, you pick all the blackest black ones (or reddest red, etc.) then you do a second sweep for any you might have missed. But since you already picked the blackest ones, the darkest of the remaining ones look blackest when they are in fact NOT -- you rejected them in the first sweep. This can happen if birds have picked the ripe berries before you came out. Do you have them protected? The black berries on the left are when I just picked them and over night on the counter top or in the fridge they turn purple like the ones in the pictures on the right were picked yesterday. I'm definitely picking them a little early or the critters all get them, I guess on the small scale I should have an enclosed netted area, but In the future I planned on planting a couple acres of blackberries, loganberries,raspberries and figs. How would you keep the birds of the berries in an acre or more? Anyone tasted there PAF berries yet? Most growers who have any large area of berries try to keep the birds out by various methods. From flapping spinners to humming string...but in general we accept that a percentage will go down the birds throats, usually the rows that are nearest to the hedges! catfishhoward wrote: The PAF berries when I pick them look black but the next morning there purple and not so good tasting? anyone else have this problem or do I have something else going on? Blackberry canes are really taking off.